The line-up for Southeast Asia’s biggest underground dance music festival has gotten even bigger. Last week, the organisers released the second wave of acts set to grace the decks at the third edition of Epizode festival on idyllic Phu Quoc island in southern Vietnam. In addition to the previously announced Nina Kraviz, Seth Troxler and Ricardo Villalobos, the best beaches in Kien Giang province will play host to French supergroup Apollonia, Romania’s Dan Andrei, as well as Dubfire, Ferry Corsten and Sammy Dee during the 11-day festival. Vietnam-based Nic Ford, one half of British electronic duo MadderModes and resident of top clubbing hotspot The Observatory, will also be in attendance. The full raft of acts can be found on Epizode’s website below. The latest line-up news continues Epizode’s international flavour, bringing some of the top names from a wide range of scenes. The last two editions of the festival served up world-renowned electronic music artists, including Carl Cox, Marcel Dettmann and Call Super. This year’s party looks set to be another unmissable event for dance music lovers. 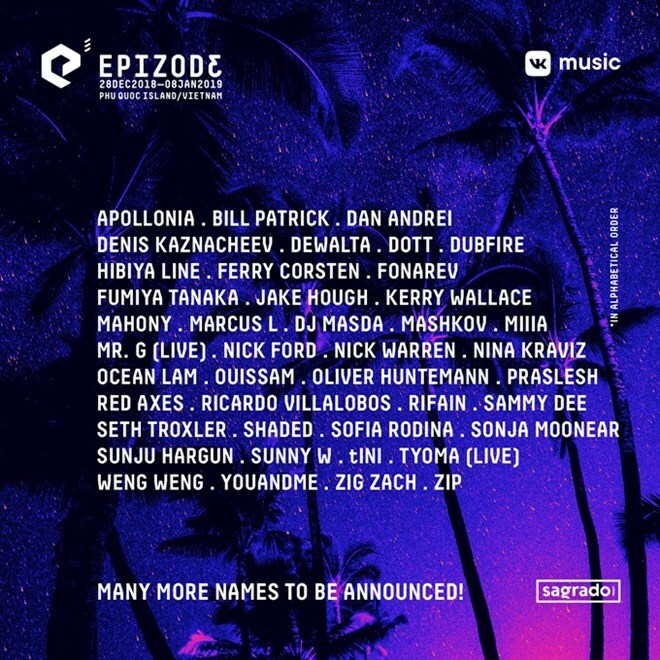 Running from December 28 to January 8, 2019, the third edition of Epizode will again dish out 11 days of world-class house and techno, with the tropical paradise as the perfect backdrop for impressive stages, thumping dance floors and installation art pieces.